I now have a pattern sequencer. One I can work with, that is. New in the barn is a used Casio CTK-7200. It does have a pattern sequencer, and at the time I write this I am learning how to use it. It's very cool that this synth has a pattern sequencer, a song sequencer and an arpeggiator. And it also has a full sound set that includes both modern, classic and vintage sounds. No two synth brands do things the same way. There's "The Roland Way", "The Korg Way", "The Yamaha Way", and so on. For me, I'm learning "The Casio Way". Getting to know a pattern sequencer doesn't happen overnight. It takes time. There are always tons of menus to go through, tons of things to experiment with, and many hours spent flipping through the manual just to figure out what does what. Is it worth spending the time to do this? Yes. Once I learn how the Casio does things, backing track and song creation goes forward quickly after that. 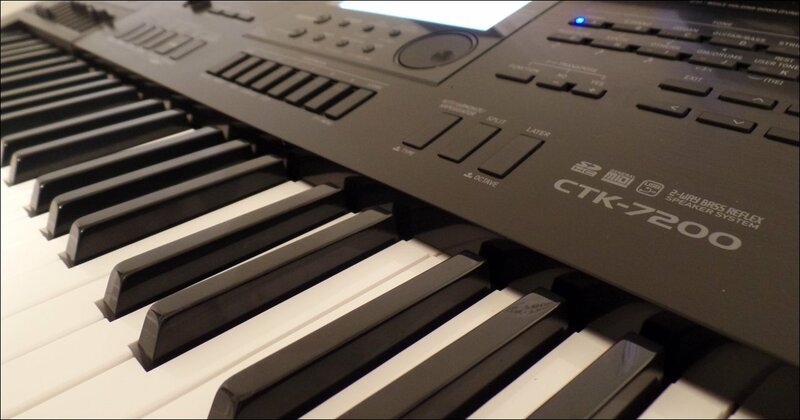 Is the Casio CTK-7200 or WK-7600 the cheapest way to get a "true" workstation synth? To be best of my knowledge it is. In my research, I found Casio was the only one that offers a true workstation synth with full-size set of keys, full sound set, arpeggiator, pattern sequencer and song sequencer for under $500 at the time I write this. And being I bought mine used, I got it for cheap. And by cheap I mean under $300. That's pretty much as good as it gets. To put this in perspective, after this specific Casio the price jumps up big time. Arguably, the next step up is the Korg KROSS. After that, you're into big money with the Roland FA-06 and Yamaha MOXF8, which by the way are considered "midgrade". Top end models will cost you over 5 grand. When you see the prices of those workstations, the Casio CTK-7200 and WK-7600 are absolute bargains in comparison. I mention the WK-7600 because it's functionally identical to the CTK-7200. The difference is that the 7600 has 76 keys and the 7200 has 61 keys. Oh, and one last thing. The CTK-7200 and WK-7600 do not require a computer whatsoever to use any of its features. Everything can be used standalone, and that is what I wanted. I don't even need to plug in speakers since it already has them. There is no danger of anything becoming suddenly incompatible from software revisions, and that is something I very much appreciate.